In Pictures: Glasgow 812 as you’ve never seen it before! In the last full week of the school summer holidays a special event was held at Crich with children – of all ages! – encouraged to get involved at the museum building with Lego bricks. 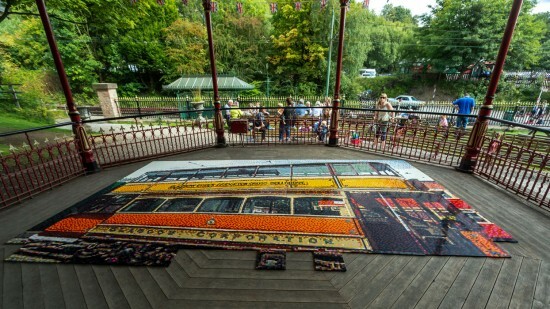 This included creating a mosaic of Glasgow 812 using Lego which was built in the Bandstand at Victoria Park – and it was an incredible sight! 81,920 Lego bricks were required to complete the mosaic with 320 Lego base boards (each containing 256 small bricks). In other words an awful lot of Lego was needed to create this spectacular sight!